ONE OF THE hidden forces in modern hi-fi and AV manufacturing is International Audio Group (IAG). But grab Joe Average (the one with a passing interest in stereo gear) as he wanders the halls of his local chain store’s electronics section and ask if he’s heard of IAG, and you’re likely to get a blank look, or he’ll mention that he’s insured with IAG (that’s the wrong IAG, Joe). However, ask if he’s heard of Mission, Wharfedale, Quad, Audiolab, Luxman or Castle and you’re likely to get a nod and a grin. These iconic brands are now part of the IAG stable. The company is very serious about its products, as evidenced by the accolades and glowing reviews generated worldwide, not least of all the ones that the Witchdoctor team have awarded to IAG products over the years. Witchdoctor: It’d be great if I could give our readers some information about you and your background. So to start with, I’ll pose a multi-part question. How did you originally get involved in the hi-fi game, what led you to speaker design and how did your design career take you to IAG? Peter Comeau: I began my career in hi-fi by selling it in the, then, hallowed audiophile mecca of Tottenham Court Road, London, which was, I may say, an excellent grounding in finding out what people want from their hi-fi systems. I moved fairly quickly into writing for hi-fi magazines as a reviewer and then, realising that there was a gap in the market for a small, low cost monitor-class loudspeaker, tried my hand at speaker design. Two years of experimenting yielded a loudspeaker that my friend and I were satisfied to use in our own homes and we jointly started Heybrook Hi-Fi. I ran Heybrook for 15 years and then sold it just as business was getting overly tough, to go back once again to reviewing. I also did a spot of consulting for NXT, the flat panel speaker company, and that led me to join Mission in 1999 as Director of Acoustic Design. As you’re now aware, IAG purchased Mission and, eventually, I took up the same job in China, only this time working with all the brands that IAG own. 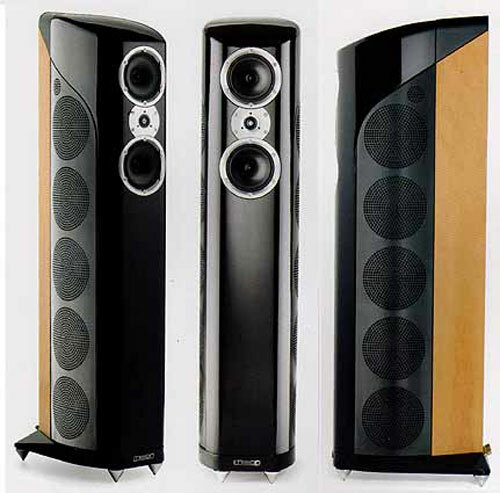 WD: You’re tasked with the acoustic design of some very high profile, even iconic speaker brands. All of them have distinctive characters and long histories. Given that, how focused are you on retaining the overall look and sound of a particular brand? A set of Mission speakers is a very different proposition to a set of Castles but they’re made in the same factory working to overall economies of scale. Surely there’s a temptation towards parts sharing and uniformity? PC: What intrigued me about IAG, and I made sure that I could highlight this policy when I joined them, was the emphasis on keeping the characteristics of each brand alive. Remember, I grew up with all these famous brands, even selling a lot of their products when I was in retail, so I feel I have a good handle on what they stand for and who their principal customers are. In fact the first speakers I ever built, as a teenager, were Wharfedale Unit 5 kits. At IAG we keep brands distinct from each other. By that I mean that we have unique methods of designing for each brand, both in appearance and technology, and manufacture specific parts for them too. We are well aware that uniformity would devalue the brands, so I’m always putting a different hat on, so to speak, when I sit down to design products for each brand. WD: Mission speakers cover the range from entry level to the mid-level (i.e. NZ$599 for MX to NZ$7999 for the top of the EX series) and the older E Series speakers are still listed on the UK site. Is there scope to develop a higher-end range within the Mission brand to replace the Pilastro model? PC: I designed Pilastro for Mission at a time when it needed a flagship loudspeaker to raise the brand’s profile. There’s not so much of a need for that now and I’d rather concentrate on doing what Mission does well and that is bringing high technology and performance to advanced loudspeakers at affordable prices. 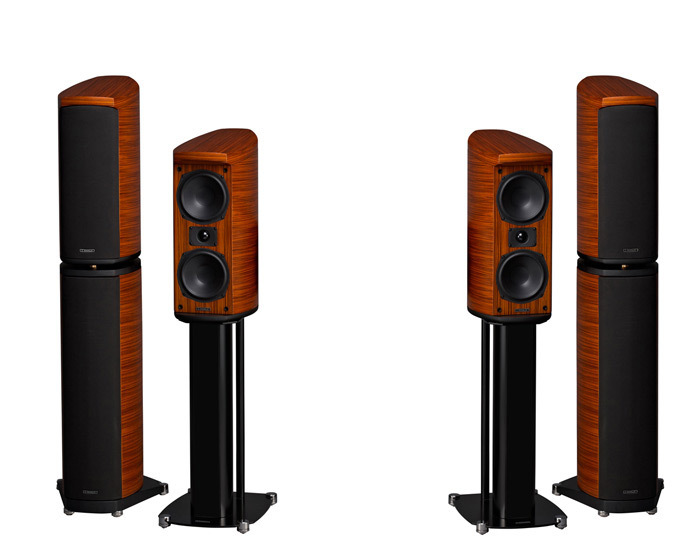 Mission’s new SX series shows what we can do to make a loudspeaker which is utterly beautiful in style yet contains advanced technology for stunning sound quality, all of which you would think are the province of high end speakers. I’m very proud that we can deliver this level of performance at an affordable price. WD: According to our reviewer Andy Baker, some of the original Mission computer-controlled woodworking machines were shipped over from England to be used for manufacturing the Mission range at IAG. Would you say that the product quality has improved since IAG took over? If so, what led to the improvements? PC: IAG are still using those CNC woodworking machines because they have features which enable us to produce very accurate parts. Where Mission cabinets have improved under IAG is in the application of high quality hand veneering and finishing which just wasn’t possible to achieve, because of cost restraints, in the UK. WD: What’s really changed about speaker design in the last 20 years? The fundamentals seem to be the same, so is your job more about refinement than breaking new ground? PC: You know I’m often asked that, especially by people who still have loudspeakers that they bought 20 years ago! The simple answer is that we now understand much more about the fundamental science of hi-fi reproduction. For example the work NXT engineers did on panel and diaphragm modal resonances now enables us to make drive units with wide bandwidth and lower distortion and coloration than ever before. But what’s really changed is that people now want small loudspeakers to do the same job that huge behemoths did 30 years ago. The first Wharfedales I built had 12-inch bass units. We now expect speakers with 5-inch bass units to do the same job! We can still break new ground, though, as I’ve explained below. WD: What’s the next big trend in speaker design, and in hi-fi for that matter? PC: We’re on the verge of being able to use a single driver to cover the majority of the audio spectrum. To this we just need to add a sub-bass unit, keeping the crossover well out of the ear’s sensitive region. There have been full-range drivers before, of course, but they have all compromised directivity and coloration. The new driver we’ve been developing for the past five years has none of these limitations and it’s a very exciting development. All this has come about thanks to the research done at NXT into the modal performance of modern diaphragms. WD: What’s your take on the whole “the future is wireless” theory, where loudspeakers will be fully powered or active and hooked up to nothing more than a power cable with the source being a Wi-Fi-connected computer, tablet or phone? PC: Up until recently wireless speakers have had problems to contend with if the user wants true hi-fi performance without limitations. Most wireless systems use the 2.4GHz band which is flooded with competing transmissions and is prone to noise, distortion and interruptions to the data stream. In addition typical wireless systems are only capable of 16 bit/44kHz transmission at best and are often compromised by data compression. We can use systems like Bluetooth and Wi-Fi with small, wireless speakers that match mobile devices but, for audiophile standard performance, we have to look further. We’ve been working for the past two years with a system that utilises a dedicated section of the 5GHz band and is capable of transmitting 24bit/96kHz without compression, which is a huge breakthrough in quality. Within the next year you’ll see wireless speaker systems from IAG that use this transmission system. Actually the average hi-fi enthusiast doesn’t see much advantage in having a pair of wireless speakers for stereo use. A pair of wired active speakers or conventional passive speakers meet the market requirements just as well. Where wireless scores big time is in the AV market. Few people like trailing wires around the room for rear speakers and a subwoofer. To be able to provide a complete, wireless, 5.1 or even 7.1 speaker system which just needs hooking up to your computer/net streamer, DVD player and TV using HDMI is like a dream come true. And it will come true very soon! WD: How closely do your speaker design teams work with the amplifier and source design teams? PC: We all work together, is the simple answer. I’m constantly sitting in on the fine tuning of electronic components, like amplifiers, CD players and DACs and we make sure that the same brand differentiation is kept alive, no matter whether we’re designing an amplifier or a pair of speakers. Similarly, we’ll match electronics to loudspeakers within a brand to make sure they achieve the very best performance possible. It’s what buyers expect after all. WD: When it comes to the old discussion about what’s the most important part of any audio system, some folk are source first, others are all about the speakers or amps and some favour a balanced approach – what do you reckon? PC: I’ve spent 35 years matching components in audio systems and it was very clear to me, early on, that an audio system is only as good as its weakest link. You have to balance the performance of every single part of the system. The source has to be good, (you can only get out what you put in), the amplifier has to be able to drive the loudspeakers without compromise and the speakers have to reveal what is being fed to them. There’s often a system synergy between audio components. I do my best to design speakers that don’t tax amplifiers unduly, for example, but you can still find that a particular speaker favours a certain amplifier design and so on. There’s no trick to this, it’s just a marriage of compromises which often works to bring out the best of both items. Let your ears be the judge, have confidence in your reaction to the enjoyment of the music you’re listening to, and you won’t go far wrong when choosing system components. 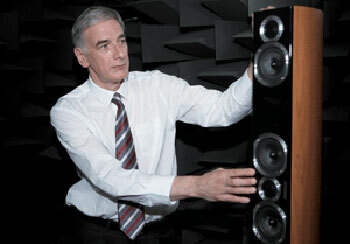 Hello Peter, great article and glad to see you’re still designing great speakers! It’s been a long time since the Heybrook by D’Ascanio Audio days, but several of our divisions are still directky in the audio buisness. wharfedale diamon have a bad caps: china caps 8,2mf and 15mf.